FISHBUOY Platform is a decision support system that helps fishermen, businesses and organizations accomplish their goals in the fishing industry. FISHBUOY Mobile and FISHBUOY TripPlanner are software solutions designed to help fishermen determine when and where to fish. FISHBUOY uses a science-based approach that predicts which locations have the optimal conditions, using historical and real-time water, weather and fish biology. Fishermen are always looking for the edge and invest a great deal of time and money finding the secret to catching more fish. The reality is, fish biology already tells us what they want. FISHBUOY software help you tune in. Fishermen often rely on word-of-mouth and chatter from forums to determine fishing conditions. Why not build your own knowledge? 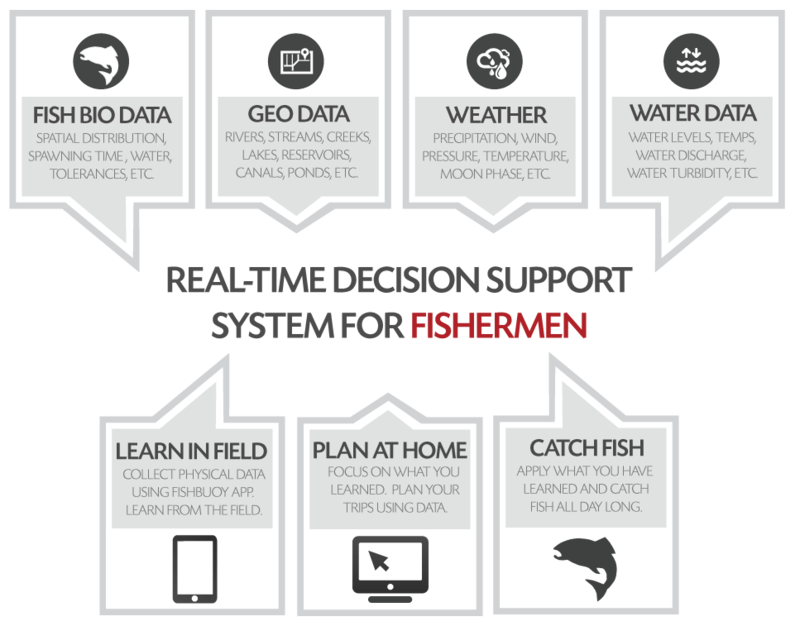 FISHBUOY focuses on the science behind fishing and provides you with the tools to make your own educated decisions. Not all fishermen understand the biological triggers for each fish species. FISHBUOY offers features to build your knowledge, or simply use the Fishing Success Index (FSI) that pulls from our comprehensive fish biology database. Not all fishermen understand the significant influence water conditions have on catching fish. FISHBUOY helps fishermen correlate the relationship between water, fish catch and location to help with future planning. People new to fishing, or fishermen new to a region, do not have the connections to learn about fishing. FISHBUOY offers mapping and social networking features to help you. FISHBUOY Platform helps fishing retailers, lodges and NGO's communicate their valuable products and services to the fishing community. FISHBUOY Platform is customizable to integrate with other big-data systems to increase the number of impressions and convert interest into sales or funding. We know it's all about visibility to get customers to your store. We love fishing as much as you do and know how important it is to align your products and services to the needs of fishermen. FISHBUOY offers dvertising opportunities via In-App ads, online ads, and targetted marketing campaigns. If you love fishing as much as we do, and your business caters to helping fishermen become more successful, then it might be worth a chat! We offer co-marketing opportunities for companies aligned to our goals. FISHBUOY Platform is the first North American-wide, single software platform that integrates state and provincial fishing, water and weather data with a real-time social feed from fishermen. FISHBUOY is an incredibly powerful tool to support long-term and sustainable fisheries for years to come. FISHBUOY Platform is perfect for managing derbies and tournaments for both fisheries and event organizers. Imagine having the ability to track fish catches live, in real-time throughout the tournament. See where people are catching fish on a map, identify species and relative size and health, capture water and weather data and much more. Email us to inquire! Fishermen are out there catching fish every day. Why not tap into their knowledge and experience? FISHBUOY App captures and stores fish data onto robust, big-data servers that can be shared to fisheries agencies to support improving the fishery. Fisheries agencies benefit from early and real-time warnings of invasive species through fish photos uploaded to FISHBUOY servers daily. Conducting important creel surveys is critical to managing a sustainable fishery. FISHBUOY Platform supplements creel surveys by providing real-time data about fishermen catches using a cost-effective, community-driven approach. Geomorphology dictates how and when rivers change and fisheries agencies need to know. These changes can directly impact locations of spawning grounds and the success of fish hatches. FISHBUOY App captures spatial and temporal information that supplement fisheries field studies to provide early warnings. Isn't it time to start using software that is designed for your fishing interests? FISHBUOY Platform is the latest fishing software to hit the market that is more than just an App. FISHBUOY Platform builds of environmental, biological and fishermen data to help improve your North American fisheries. For more information about FISHBUOY Platform, please email us today!